According to the data from the genealogy of Ridigers, during the reign of the Empress Catherine II the Kurland nobleman Friedrich Vilgelm von Rudiger accepted Eastern Orthodoxy with the new name Fyodor Ivanovich and became the progenitor of one of the lines of this noble gens, well known in Russia. Among the members of this gens was count Fyodor Vasilievich Ridiger — Cavalry General and Adjutant General, an outstanding military leader and statesman, a hero of the Patriotic War of 1812. The family story says that Ridigers emigrated to Haapsalu, a small town on the coast of the Baltic Sea, about 100 km south-west of Tallinn. After finishing the gymnasium, Mikhail (Mikhail Aleksandrovich, Aleksei’s father) began to seek a job. In Haapsalu there was no work for Russians except the most hardest and dirtiest, and Mikhail earned his living by ditch digging. Then the family moved to Tallinn (the capital of Estonia since 1918). There he was employed by Luther Plywood Factory. At first he worked there as an accountant, and then the chief accountant of a department. He worked at this factory until he became an Orthodox priest (1940). Church life in post-Revolutionary Estonia was very vigorous and active; first of all owing to the activity of Estonian Orthodox Church ministry. According to Patriarch Alexy’s memories, “they were real Russian priests, with high sense of pastor’s duty, caring for their flock” (Conversations with Patriarch Alexy II, Church-Scholar Centre Archive). An exclusive place in the life of Orthodoxy in Estonia belonged to monasteries and convents: Pskovo-Pechersky Assumption Monastery, Piuchtitsky Asumption Convent, Iverian Women’s Congregation in Narva. In early 1920-s, with the blessing of the Orthodox Church authorities, student’s religious groups emerged in Riga; they laid the groundwork for Russian Students Christian Movement (RSKhD) in the Baltics, Both Mikhail Aleksandrovich and his future wife Yelena Iosifovna Ridiger (nee Pisareva) were active participants of Orthodox-Church and public-religious life in Tallinn; they participated in RSKhD. Ye.I. Ridiger was born in Revel (now Tallinn), Her father was a colonel of the White Army, he was shot dead by the Bolsheviks in Terijoki (now Zelenogorsk of Leningrad Region); her maternal relatives were donors to the Tallinn Aleksandro-Nevsky Church on the Cemetery. Already before their wedding, which was in 1926, it became known that Mikhail Aleksandrovich wanted to be a priest. The state of the Ridigers’ family life was cemented with “not only ties of kinship but also bonds of string spiritual friendship”. Prior to Aleksey’s birth an incident happened which has been preserved by the family story as manifestation of God’s Provision for the future First Holy Hierarch (Patriarch) of the Russian Church. Not long before the birth of her son Yelena Iosifovna was supposed to make a far trip on a bus. But at the last moment, despite her requests and even demands, she was not taken to the leaving bus. And when she came to the next scheduled trip, she learned that the preceding bus got into a road accident and all passengers perished. The name that was given to the boy in his Christening was in honour of Alekisis, man of God. Alyosha (diminutive name for Aleksei) was growing self-composed, obedient and deeply religious. 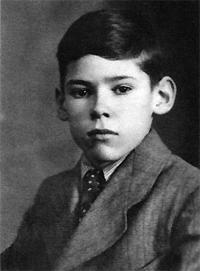 He started to study at a private school, then passed to a private gymnasium, then studied at an ordinary school. In late 1930s Russian-language theological-pastoral courses were begun in Tallinn, led by archpriest Ioannes, future Tallinn Bishop Isidor (Bogoyavlenskiy). Already in the first year of their work, M.A. Ridiger became a participant of the courses. Archpriest Ioannes, a man of deep faith and great spiritual and life-long experience, was also the catechist at the school and the spiritual guide of Alyosha Ridiger, who later looked back at those times: «Both by my family and by my spiritual guide I was taught to see good in people, and this was done by my parents, in spite of all difficulties they had to overcome. Love and attention were those criteria by which both father Ioannes and my father were guided (Conversations with Patriarch Alexy II, Church-Scholar Centre Archive). In 1940, after finishing the theological-pastoral courses, M.A. Ridiger was ordained as a deacon. In the same year soviet troops entered Estonia. In Tallinn, among the local people and among Russian emigrants, arrests and exile to Siberia and the northern regions of Russia began. Such destiny was also assigned to the Ridigers family, but God’s Providence saved them. This is how Patriarch Alexy later recalled it: “Before the War, like sword of Damocles, exile to Siberia hung over us. We were delivered only by chance and God’s miracle. After the coming of soviet troops, our paternal relatives moved to us, in a Tallinn suburb, and we afforded our house to them. We ourselves moved into a shed, where we had a room. We started to live there, two dogs together with us. At night they [repressive body officers] came for us, searched the house, walked around; but the dogs, who usually behaved very sensitively, this time didn’t give even a single bark. We were not found. After this incident, up to the German occupation, we did not live in the house”. In 1942, in Kazan Temple of Tallinn, ordination of M.A. Ridiger as a priest was performed, and his almost 20-year-long path of priestly ministry began. Orthodox Tallinners preserved memories about him as a pastor who was open “for trustful communication with him”. During the War years the priest Mikhail Ridiger gave spiritual guidance to Russian people who were being deported to Germany for work. In concentration camps located at the port of Paldiski and in the villages of Klooga and Pylkiula, in very hard conditions, thousands of people mainly from the central regions of Russia, were kept. 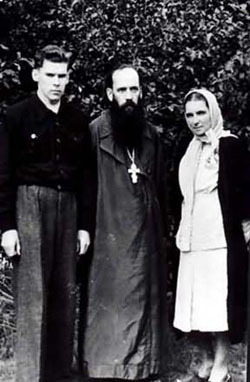 Communication with these people, who experienced many hardships and suffered a lot, who went through persecutions in their native country but remained faithful to Orthodoxy, astounded reverend father Mikhail, and later, in 1944, it strengthened him in his decision to stay in the Motherland. “Since the first days of Hitler’s occupation, when on the territory of Estonia concentration camps appeared, my father considered it his Christian duty to visit them regularly. The Germans did not prevent him from doing that. Father used to take me with him as a boy server. I have never seen such unbearable grief, physical and spiritual sufferings, human dramas and tragedies concentrated on a small patch of land. People from Russia — POWs from the Red Army and workforce from peaceful towns and villages — were brought to Estonia in much worse conditions than cattle for slaughter. They were practically not fed, they were given rotten or rusty water to drink… Those pitiable people from central Russia saw the sea for the first time and for some unknown reason they decided that they would be certainly sunk in it. We tried to help them at least in some possible way: gathered for them provisions, clothes, medicines. A room was allotted for us in a barracks, or simply a pigeonhole was screened off. A portable altar was put there and the worship services were performed”. Combat actions were approaching the Estonian borders. In the night of 9-10 May 1944 the city of Tallinnn was heavily bombed; during this air raid many buildings were damaged, including those in the suburb were the Ridigers’ house was located. A woman who was in the house was killed, but reverend father Mikhail and family were not injured — exactly that night they were not at home. On the following day thousand of Tallinners left the city. The Ridigers stayed, although they understood perfectly well that with the coming of the soviet troops the danger of being exiled would constantly threaten the family. It was at that time that Yelena Iosifovna assumed a prayer rule: every day to say an acaphistus before the icon “Joy of All Who Sorrow” of the Mother of God, “because she had many sorrows, as she transmitted everything concerning her son and husband through her heart”. In 1944 the 15-year-old Aleksei Ridiger became senior assistant deacon of archbishop of the town of Narva Pavel (Dmitrovsky), who in March 1945 became archbishop of Tallinn and Estonia. To Aleksei Ridiger, as senior assistant deacon and second psalm reader, a task was committed, by the diosecan authorities, to prepare Aleksandro-Nevsky Cathedral for opening; in May 1945 worship services began to be performed in the cathedral again. Aleksei Ridiger was an altar servant and vestiary in this cathedral, and then a psalm reader in Simeon and Kazan churches of the Estonian capital. St Alexis, man of God, – а saint honored both by Catholic Church and Eastern Orthodox Church; he is believed to have lived in the late IV –early V centuries.